At Bundoora Dental Clinic our emphasis is on prevention. We aim to maintain your teeth and gums in a healthy condition for life. If your mouth is already healthy we will review it regularly and advise you on how to keep it that way. If you have pain or problems with your teeth or gums, our initial aim will be to ease the pain and correct those other problems so we can then concentrate on the prevention of potential future issues. To do this we will need to thoroughly examine your teeth and mouth. We may need to perform special tests and take x-rays. This will enable us to diagnose any problems you should be aware of. Your ideas and perceptions of what your needs are in regard to your teeth are important and we listen to these to help us formulate a treatment plan to suit you and to keep your mouth in optimal dental health. 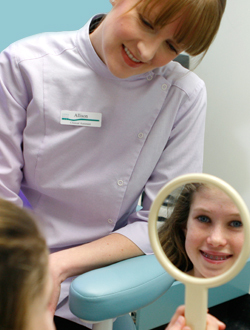 The treatment you require may involve nothing more than scaling and cleaning and oral hygiene advice. If your gums are unhealthy we can help you return them to periodontal health and keep them that way. Some of the problems you have may involve the placement of restorations or replacement of missing teeth. We are able to suggest many ways to achieve this. To fully restore your smile and mouth to be functional and aesthetically attractive may require only simple restorations but may involve teeth whitening, porcelain veneers, crowns, bridges, implants or even partial dentures. We can advise you on these options. If you are in pain you may require treatment to relieve the pain such as medication or an extraction. Where possible we try to avoid the trauma of an extraction and relieve the pain through Endodontic Therapy (root canal treatment). Wisdom teeth may sometimes require extraction. All of our dentists are fully qualified and experienced in oral surgery to remove wisdom teeth at Bundoora Dental Clinic. We provide comprehensive treatment in a caring environment where we work in conjunction with you to meet your dental aspirations. We then provide ongoing preventive maintenance and support.